8' Featherlight. 2-piece with double lock down comfort fit reel seat, taper fit ferrules, aluminum oxide guides, 5-6# line, line keeper, top quality specie cork split handle. 7 guides with tip. This rod will handle the big ones. 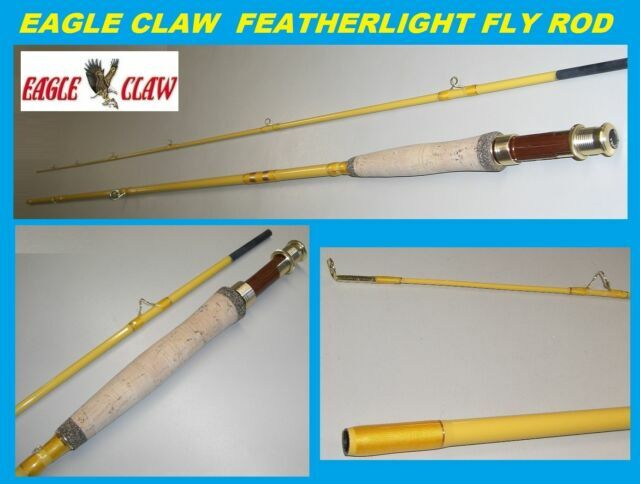 Fenwick Fenglass Fiberglass Fly Rod 7wt 8'3"
Good fly rod for the price. I bought this rod for friends and grand kids to use. It has a medium flex which is good for feeling the line load the rod. Tip could be a little stronger for casting but works great out to 35 feet. Guide placement was OK for 2-3 pound fish. Every fish is a big fish on a rod like this which makes fishing fun. Took it out for the weekend, and had a blast!! You can feel the trout bite and when Ya hook one it will feel like a monster. So much fun for the money!! I recommend everyone to get one of these rods. Even if it's not your everyday rod. So worth every penny I paid. Now I will buy the 7 footer give it a try. Great for beginners rod just because of cost. As a two piece, it is a little harder to pack, but for the price, it is hard to beat. Cortland Competition Nymph Fly Rod 10 Foot 6 Inches 3 Wt. NEW G. LOOMIS NRX 1085-4 LP G 9' 5 WT Light Presentation, Offers Welcome. CRYSTAL RIVER CAHILL 99%25 GRAPHITE 8' 0" #5/6 FLY LINE FLY ROD.NEW. ( CH-675 ).